I don't usually work in such chaos, but since I am writing about my workspace, I thought I would terrorize you all with the state of mine at the moment. In my frenzy for inventory, I am working on no less than 10 pieces at a time. I can't explain the method to my madness, but somehow it works. As you can see, I have filings and scraps everywhere since I can't take the time to straighten up before starting another project at the moment. Jewelry is not the only crafty thing I am into. I also make altered art books with some far away friends of mine. We do a few pages, and send it off to the next person, it is so thrilling to get the book back after friends from all over America have worked on it, but that is for another post. 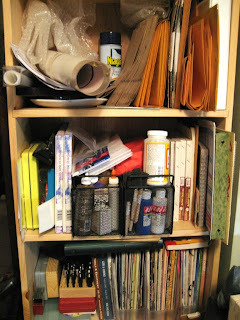 These wire drawers contain all of my little bits and scraps of collected thingamagigs, and all stuff crafty. Just to the right is a box of mat scraps that I peel the interesting textures off to use in altered art. 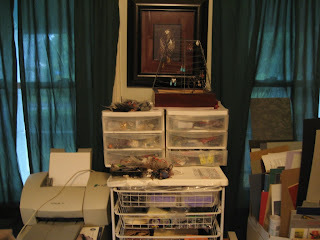 On top of the wire drawers are small storage containers for all my beads and gemstones. Paint, glue, tools, catalogs, magazines, shipping supplies, and god only knows what else is stored in this tall shelving unit. I hope you all enjoyed looking at my mess. I enjoy being immersed in it. 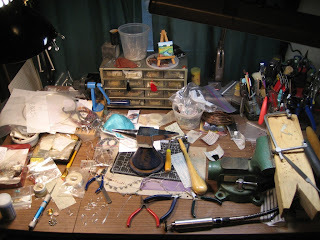 I hate it when my workspace gets really chaotic--yours actually doesn't look that bad!